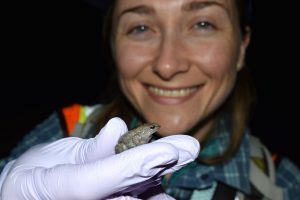 I am a postdoctoral researcher in the Richards-Zawacki lab, investigating the impacts of a changing climate on the amphibian immune system, and how future climate scenarios may affect the occurrence of chytridiomycosis outbreaks in North American amphibian populations. This work spans controlled laboratory experiments, mesocosm experiments in situ, and extensive long-term monitoring of field sites in Central Louisiana and Northern Pennsylvania. In addition, I am utilizing a combination of mechanistic niche modeling and thermography to examine the role of available thermal habitat in predicting disease outcomes. My research interests include disease ecology and amphibian conservation physiology, and the intersection of these fields. 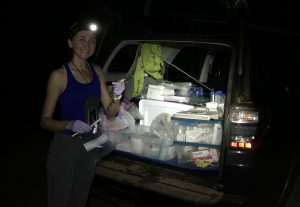 Broadly, I seek to understand the drivers of variation in susceptibility between species and individuals, with a focus on the devastating amphibian disease chytridiomycosis. I am also fascinated by the thermal ecology of hosts and pathogens, and the interaction between temperature, immune function, and disease. I received my PhD from the University of Queensland, in Brisbane, Australia, in 2016. For my dissertation, I examined the role of routine skin sloughing in the pathogenesis of chytridiomycosis, and how variation in sloughing rates and skin characteristics can drive variation in disease susceptibility across species. This work demonstrates the importance of understanding basic physiological functioning for the conservation of threatened organisms. I also enjoy science education and outreach, and have been involved in the creation of the Ectotherm ER module designed to teach middle school students about the effects of climate change on ectotherms. Related to this work, I serve as a research mentor for both NSF Research Experience for Undergraduates and Research Experience for Teachers programs at the University of Pittsburgh’s Pymatuning Laboratory of Ecology. 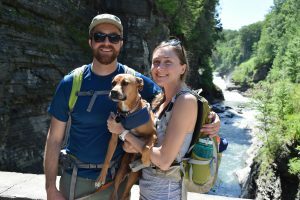 When I’m not in the field or the lab, I enjoy hiking, dancing, photography, and going on adventures with my husband Jeff and my pup Darcy. Follow me on twitter @m_ohmer and Google Scholar. Russo, C.J.M., Ohmer, M.E.B., Cramp, R.L., and Franklin, C.E. A pathogenic skin fungus exacerbates cutaneous water loss in amphibians. In review. Ohmer, M.E.B., Cramp, R.L., White, C.R., and Franklin, C.E. 2015. 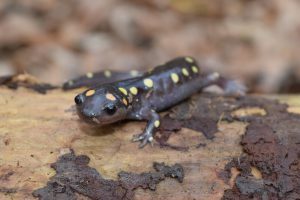 Skin sloughing rate increases with chytrid fungus infection load in a susceptible amphibian. Functional Ecology 29:674-682. Cramp, R., McPhee, R., Meyer, E., Ohmer, M., and Franklin, C. 2014. First line of defence: the role of sloughing in the regulation of cutaneous microbes. Conservation Physiology 2:cou012. Ohmer, M.E., Herbert, S.M., Speare, R., and Bishop, P.J. 2013. 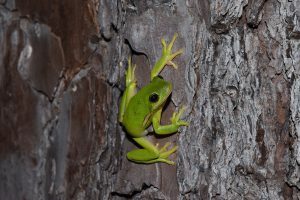 Experimental exposure indicates the amphibian chytrid pathogen poses low risk to New Zealand’s threatened endemic frogs. Animal Conservation 16:422-429. Ohmer, M.E., and Bishop, P. 2011. Citation rate and perceived subject bias in the amphibian-decline literature. Conservation Biology 25:195-199. Ohmer, M.E., Robertson, J.M., and Zamudio, K.R. 2009. Discordance in body size, color pattern, and advertisement call across genetically distinct regions of a neotropical anuran (Dendropsophus ebraccatus). Biological Journal of the Linnean Society 97:298-313.